Somewhere along the line, I grew up, and started eating more “mature” things for breakfast (cereal?). But whenever I’d find myself in a bagel shop (mmm, Middlebury Bagel Deli) I’d be drawn toward a cinnamon raisin bagel. With cream cheese. The next morning, I toasted that bagel in our mini oven and slathered it with what ended up being neufchâtel cheese. Accompanied by a mug of Diablo with organic half and half, looking at the view of Mt. Rainier, I was a changed girl. A Seattleite? Perhaps not yet, but definitely a girl in full-on food snob mode (“um, I only eat artisan bagels with organic neufchâtel cheese accompanied by expensive local coffee and organic half and half”). 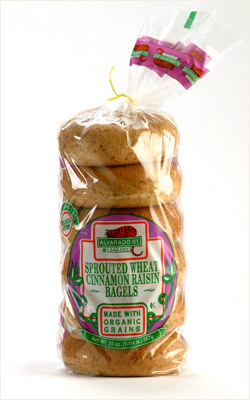 A few years later, I’m still enjoying those delicious Alvarado Street Bakery sprouted wheat cinnamon raisin bagels. Mind you, they can usually only be found at AmazonFresh, PCC, and sometimes Whole Foods. Since I usually shop at Fred Meyer, I’ve had to look for substitutes. I was thrilled when a few weeks back I spotted Robust Raisin from Dave’s Killer Bread. I promptly purchased a few loaves (who knew if I’d find it again!?) and went home happy. But it was a serious let down. Why? It doesn’t toast! I’ve never seen anything like it. It goes from fresh bread to burnt outside and soft inside in one toast cycle. It’s no good at all. That, and for some reason my beloved neufchâtel cheese just isn’t the same on bread slices. Not sure why. But it’s just not. Moral of the story folks – if you’re a food snob like me, and you need a hearty “adult” cinnamon raisin variety, Alvarado Street Bakery sprouted wheat cinnamon raisin bagels are the way to go. Order them from AmazonFresh. Or, on the bakery’s website. Only $2.40 for a package – that’s a steal!